Becoming a millionaire, paying off the mortgage early and travelling the world are some of the more predict­able ambitions. But also included on a list of 50 things the average adult dreams of doing are some slightly more bizarre aims. Inventing a product that changes people’s lives, for instance, or abseiling down a mountain might not be on everyone’s to-do list. And as for flying a plane, climbing Everest or learning to surf, the majority of adults will never pluck up the courage to do any of these. Seeing the seven wonders of the world, going on safari in Africa and swimming with dolphins are among the list of 50 things the average person wants to do before they die. 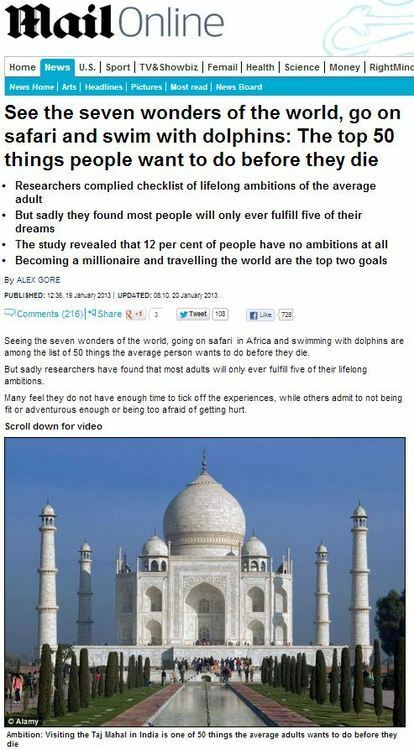 But sadly researchers have found that most adults will only ever fulfill five of their lifelong ambitions. Many feel they do not have enough time to tick off the experiences, while others admit to not being fit or adventurous enough or being too afraid of getting hurt. A spokesman for clothing company Helly Hansen, which commissioned the study of 2,000 adults, said: “It is fantastic to see that so many people still have a passion for taking to the outdoors in order to experience new challenges, but a real shame to see that some may not achieve lifelong ambitions because of a lack of faith in their own ability. “We are only too aware of the positive mental effects and increased confidence associated with physical activity in an outdoor environment. 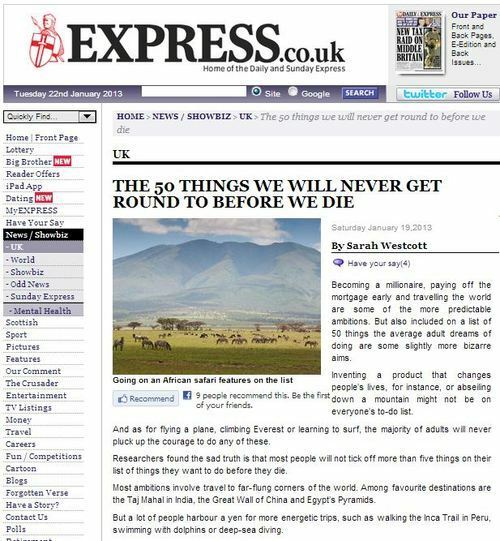 This entry was posted in Uncategorized and tagged alex gore, daily express, daily mail, helly hansen, sarah westcott on January 31, 2013 by Michael Marshall.